Look out, Loudoun. Here they come. Today is the last day of the school year for close to 80,000 students. That means, for many, homework time will be replaced with lazy mornings and afternoons outdoors. And they’ll get a balmy sunny weekend to kick off their summer break. 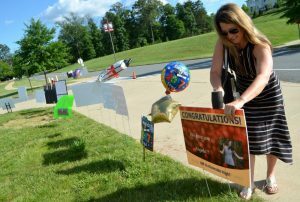 But before the students go, most Loudoun schools are getting creative to say congrats and farewell. Belmont Ridge Middle School students arrived at school this morning to be greeted with signs that read “Way to go!” and “Off to High School!” Posting yard signs with shout outs to their kids has become a tradition for Belmont Ridge parents. 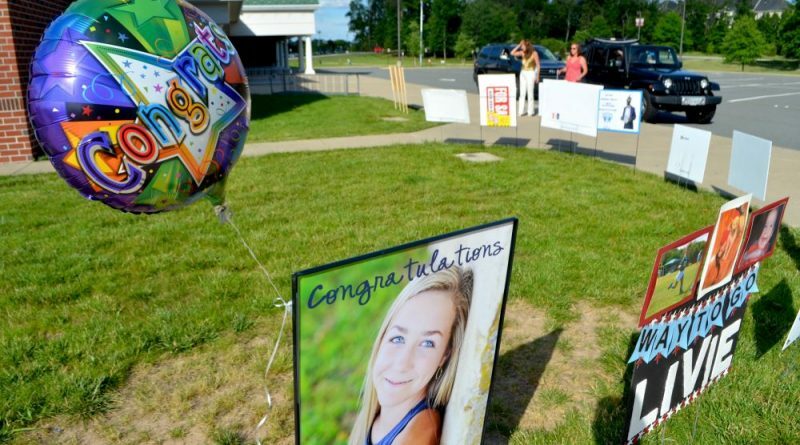 “It’s a fun way for them to end their middle school career,” said Jennifer Reimert, just as she delivered a sign addressed to her daughter, Angela. It reads: “Off to Riverside High,” referring to the county’s newest high school. It’s a special weekend in the Reimert household. Angela is graduating from middle school and her younger brother is wrapping up his elementary career at Seldens Landing—and grandparents from California and Pennsylvania are in town to celebrate. “This is a big year for us,” Reimert said. Schools throughout the county are capping off the school year with a bit of fun. To name a few: Trailside Middle School students are burying a time capsule; the Aldie Volunteer Fire Department has promised to stop by Aldie Elementary School to douse the students during a game of red light green light; teachers who’ve volunteered to sit in a dunk tank at Dominion Trail Elementary are the ones who will get soaked this afternoon; fifth-graders at Legacy Elementary will wrap up their school year with a mile-long running race; and students at Round Hill Elementary have planned a flash mob. Fifth-graders at Sully Elementary will do community service activities as their last act as elementary students. “Hornets give back,” Principal Colleen O’Neill said. Most students in Loudoun are out of school for the next 11 weeks. The 2017-2018 school year begins on Thursday, Aug. 24, for the Loudoun County Public Schools and most area private schools. It’s graduation week in Loudoun. See the full schedule of commencement ceremonies here. View our Spotlight on Grads special section here.